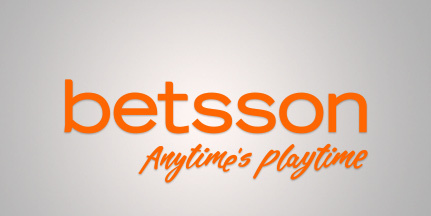 Betsson is one of the larger non-UK online bookmakers in the world, with currently around 4 million visits per month. This online bookmaker is part of the Betsson AB Group that is the holding company of several other well known non-UK bookmakers such as NordicBet, Betsafe, KroonCasino and may other bookmakers and casinos. Betsson AB is a listed company on Nasdaq Stockholm. 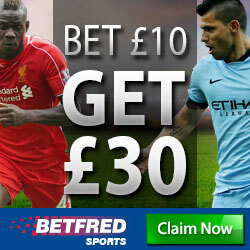 Betsson is a 100% reliable bookmaker and offers spectacular odds for the major competitions and tournaments. If you are a punter who particularly likes to bet on the “bigger” sporting occasions, then Betsson is a very sensible choice. But other than these top events, Betsson is unfortunately around average. Deposit €$ 55 and you get €$110 to play with – a 100% bonus. The bonus must be wagered 10 times with minimum odds of 1.50 per bet slip. System bets do not contribute to the wagering of the bonus. The activated bonus must be wagered within 30 days upon requesting a withdrawal. Minimum deposit amount is €$10. Betsson does not accept UK customers. This is a general summary of the odds that are offered by Betsson. It is clear that Betsson is targeting the worldwide betting market with very attractive odds for the English Premier League. But for the other English competitions (English Championship, the English League 1 and the English League 2) the odds offered are poor. If you frequently bet in these other competitions, you are throwing away money. Champions League and Europe League odds are excellent and very solid. The odds for the 4 major European competitions (German Bundesliga, Italian Serie A, Spanish Primera Division and French Ligue 1) are relatively low with payout ratios of 94%. These are slightly lower than the market average. For the 2nd tier European competitions (Turkish Super League, Dutch Eredivisie, Belgian Eerste Klasse), the odds have payout ratios of 94% which is average. For the Portuguese Primera Liga, the odds are very attractive. LIVE betting is average: odds offered generate a payout ratio of around 93%-94% for all Football competitions. For Tennis (both men’s and women’s Tennis), the odds are spectacular for the grand slam tournaments. If you like LIVE betting for the grand slam tournaments, Betsson is the best bookmaker for you. For Snooker the odds are average, but for the World Championship, these are much better. Darts, the odds are average. Also here, the odds are better when the PDC World Championships are played in December/January. For the Rugby Union, the odds provided by Betsson are average, but on match day these are clearly better than average. The chart below provides a summary of the payout ratios we have calculated for you. These are for 1×2 bets. 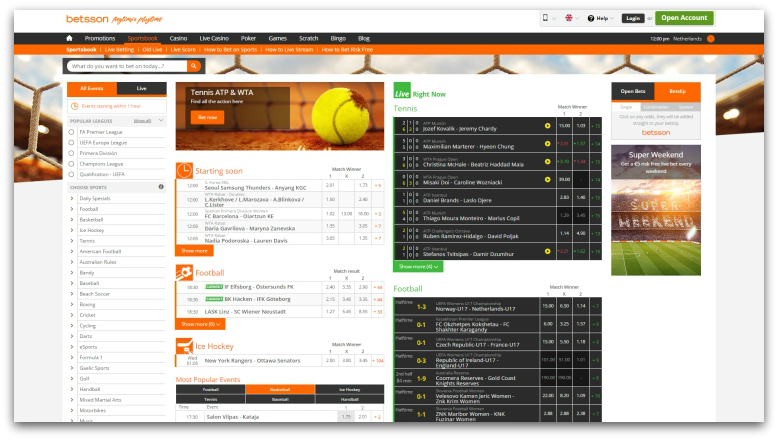 The payout ratios of other bets (such as Asian Handicap, Over/Under or Both Teams to Score) are provided on our Betsson Odds Analysis Page. The chart below provides a summary of the payout ratios we have calculated for you. These are for 1×2 bets or Home/Away bets. For more details, including a comparison with the market average, are provided on Betsson Odds Analysis Page. Betsson AB is a listed company on Nasdaq Stockholm. 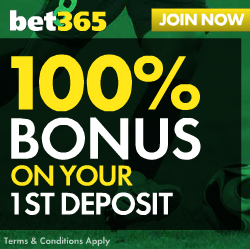 Betsson is a reliable bookmaker with a solid welcome bonus and great odds if you like to bet on UK Premier League and/or Champions League Football. Odds on tennis are also outstanding. Betsson does not accept customers from the United Kingdom.